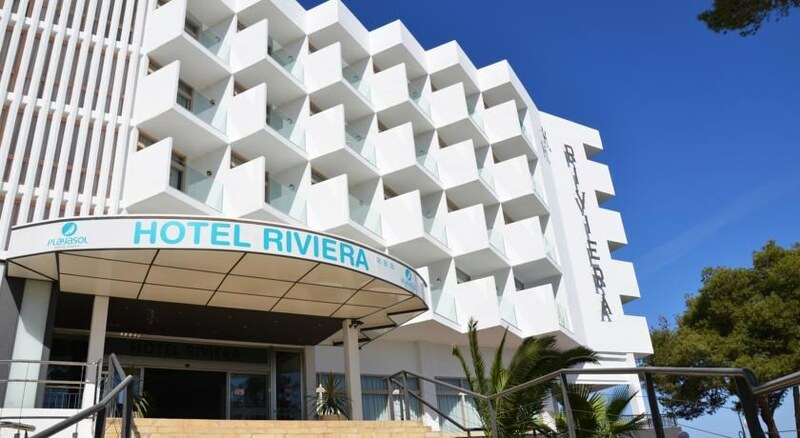 The Hotel Playasol Riviera is an ideal place to base your Ibiza holiday. Situated just 28km from Ibiza International Airport, this San Antonio Bay hotel is fringed by bars, restaurants, boutiques, attractions and much more – meaning everything you wish to see and do is accessible. Facilities at Hotel Playasol Riviera include the outdoor swimming pool and a relaxing sun terrace, while outside of the resort there’s plenty on offer to see and do. Head to the golden sands and the Mediterranean Sea waters at Punta Xinxo Beach, just a stone’s throw away. There are also many beautiful natural attractions along the coast such as Grottos and Caves of Cala Bassas. Alternatively, experience the coast in a different way by taking to the waters with Ibiza Jet Boat Experience. You’ll find a stay at Hotel Playasol Riviera is a comfortable one with rooms which are well-furnished and come equipped with the amenities you’ll need for an enjoyable stay. 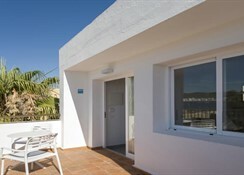 The Ibizan Hotel Playasol Riviera is located just 28km from Ibiza International Airport. Punta Xinxó Beach is a mere 200 metres from the hotel making it easily walkable in just a couple of minutes. There are many great restaurants and bars within just a few metres from Hotel Playasol Riviera with many more great options with a 1km radius. Attractions include the peaceful surrounds and beautiful architecture of the Church of San Antonio just 1.2km away.Air Zone Ibiza is an inflatable ballpark which provides fun for all the family. You’ll find a convenient supermarket, Suma Bodega Prats, just a few metres from the hotel. Your stay at Hotel Playasol Riviera will be comfortable and relaxing no matter what room type you choose. Hotel Playasol Riviera has 16 Single Rooms, 132 Twin Rooms and 20 Superior Twin Rooms With Sea View and can sleep up to four guests. Many rooms will come with their own private terrace from which to soak in the Spanish sun and enjoy beautiful views out over the sea. You’ll find all the modern amenities for a relaxing stay such as air-conditioning, en-suite bathroom, TV, safe, tea and coffee making facilities and much more. 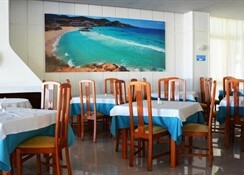 The main restaurant at Hotel Playasol Riviera serves a variety of dishes including both local and international cuisine. 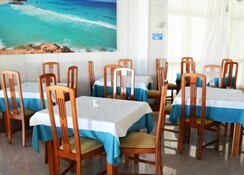 The restaurant caters throughout the day, serving breakfast, lunch and dinner. There are two bars on-site, the poolside bar serving a selection of refreshing beverages as well as a snack bar. Out and about you’ll find an excellent selection of places to wine and dine. POM Thai Restaurant serves classic Thai dishes, which are fragrant and moreish. Deeva Beach Site makes for a unique spot to eat out, catering to guests right on the beach so you can enjoy a delicious meal as you look out over the sea with dishes such as pizza and burgers and On The Rocks Ibiza is a great spot to grab a late night drink. Hotel Playasol Riviera has a swimming pool to cool down or relax in, as well as one dedicated for children to make a splash in. You’ll find a spacious sun terrace that allows you to soak in the golden Spanish sunshine, or if you want to stay a little active you can enjoy table tennis or billiards on-site too – plus a bar and lounge to unwind in. Away from the hotel, there’s plenty more to explore such as Punta Pedera and Punta des Trencs, two beautiful coastal spots from which you can enjoy stunning sea views. Also, along the coast are the Grottos and Caves of Cala Bassas and a great place to go explore these natural wonders. For a thrilling experience try the Ibiza Jet Boat Experience a thrilling speed ride over the sea.